The most interesting game was a derby match between two local teams from Tehran: Chemidor (#2) and Army (#6). Army was smashed at home by 38 points 53-91 and even the fact of playing on their own court did not help. It ended at the same time the three-game winning streak of Army. Chemidor (8-1) have an impressive eight-game winning streak. Newly promoted Chemidor maintains second position behind leader Petrochimi. Army at the other side dropped to the fifth place with five games lost. They share the position with Zob Ahan. Superleague top team - Petrochimi (9-0) managed to deliver another win. 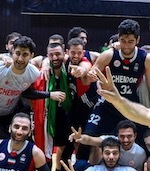 This time they beat seventh ranked Mashad (2-7) 77-63. Undefeated Petrochimi have an impressive eight-game winning streak. They maintain first position with 9-0 record. Newly promoted Mashad keeps the seventh place with seven games lost. They share the position with Pegah Tehran. Bottom-ranked Raad is still unable to win any game. This time they lost on the road their ninth consecutive match to eighth ranked Pegah Tehran (2-7) 78-67 on Wednesday evening. Pegah Tehran moved-up to seventh place, which they share with Mashad. Raad at the other side, also newcomer in the league, still closes the standings with nine games lost. In the last game of round 10 Zob Ahan was beaten by Naft Abadan on the road 63-55. Superleague top team - Petrochimi (9-0) managed to deliver another win. This time they beat seventh ranked Mashad (2-7) 77-63. Petrochimi have an impressive eight-game winning streak. They maintain first position with 9-0 record. Newly promoted Mashad keeps the seventh place with seven games lost. They share the position with Pegah Tehran. No shocking result in a game when third ranked Naft Abadan (7-2) beat at home 5th ranked Zob Ahan (4-5) 63-55 on Wednesday. Naft Abadan maintains third position with 7-2 record having just two points less than leader Petrochimi. Newly promoted Zob Ahan keeps the fifth place with five games lost. They share the position with Army.